A box of 12 packs of delicious Go Getter smoothie mixes, which you can store in a cupboard until you are ready to use them. Make a delicious and nutritious smoothie in seconds without any mess, hassle or waste! 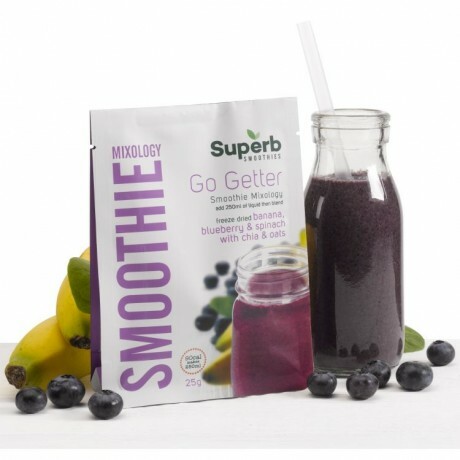 Each smoothie mix contains: 2/3 of a medium banana, 1/3 cup of blueberries, 5g of white chia seeds, 1 cup of spinach, oats. The fruit is freeze dried in order to give it a long shelf life, but keep in all the nutrients and goodness. Empty the smoothie mix into a blender. Add 250ml of liquid - water works, or you can use coconut water or diluted apple juice if you want, plus ice if you prefer it chilled. Then simply blend until smooth! Each pack in 20g. Store in a cool dry, dark place away from sunlight. Once blended, drink your smoothie within 2 hours. I Love them....:) Great tastes, no messy in my kitchen. Thank you, and I will order again soon! Tastes like I made it from fresh myself, but with zero hassle. Tastes like I made it from fresh myself, but with zero hassle. A brilliant fruit fix for crazy busy days. On a mission to provide delicious, healthy and convenient foods that help to reduce food waste.